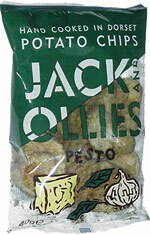 Taste test: Theser are thick and crunchy potato chips with a very nice pesto taste. They're kind of addictive, as one taster who didn't even like them upon first trying one kept on coming back for more chips, with nicer words for the chips each time he came back. Several of the chips in this bag were about as wide as your typical potato chip, but extremely long. Good stuff! Smell test: Smells like pesto.